The season finale of Game of Thrones is the highlight of the year for many TV fans. At the same time, it also generates a lot of traffic on various torrent trackers. Like previous years, Game of Thrones piracy peaked after the season ending, but not enough to set a new all-time record. 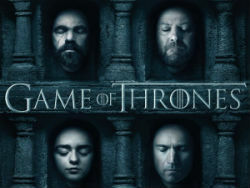 Traditionally, the Game of Thrones season finale is among the most viewed episodes of the season, also on pirate sites. With the Internet abuzz over the latest plot twists and turns, many people turned to torrent sites to grab a pirated copy of the show. The first episodes appeared online shortly after the official broadcast ended and at the time of writing more than 350,000 people are actively sharing a copy. This is the highest number we’ve seen this year. Data gathered by TorrentFreak estimates that after just eight hours, well over a million people have already downloaded the final episode of this season via BitTorrent. Millions more are expected to follow during the days to come. The most popular release is currently an HD version of little over a gigabyte. This is different from previous years, when SD copies were consistently the most downloaded of all. While the demand is significant, there is no all time “swarm record” to report. Also, the overall download numbers appear to be roughly on par with previous years, perhaps a bit lower. Although it’s too early to jump to conclusions, there are a few explanations why Game of Thrones piracy might no longer be growing, via torrents at least. For one, the number of legal alternatives have been growing steadily in recent years. Also, the same is true for “unauthorized” streaming sites where people can view pirated copies of Game of Thrones episodes instantly. Another factor may be that HBO significantly cranked up its enforcement efforts this year. As a result, it is quite hard, or impossible, to find recent Game of Thrones episodes on some popular torrent sites. The “disappearing” torrents also lead to scattered swarms, making it harder to break the previous record. Time will tell how this apparent trend develops during the years to come. That said, it is worth keeping in mind that interest in the show still dwarfs the competition. This means that there is little doubt that it will be crowned the most downloaded TV show for the fifth year in a row.